The University of the Fraser Valley women’s basketball team bounced back from a gut-wrenching defeat in impressive fashion, beating the Mount Royal Cougars 70-51 Sunday afternoon on the road. On Saturday, the Cougars had rallied from a 13-point fourth-quarter deficit to stun the Cascades 79-72 in overtime. UFV dominated the rematch, building a double-digit lead in the second quarter and steadily expanding it from there. “It was good to see – it shows we have some character in our squad,” Cascades head coach Al Tuchscherer said. “Our veterans really led the way with more of a businesslike attitude. You could sense it from the time they got in the vans in the morning. 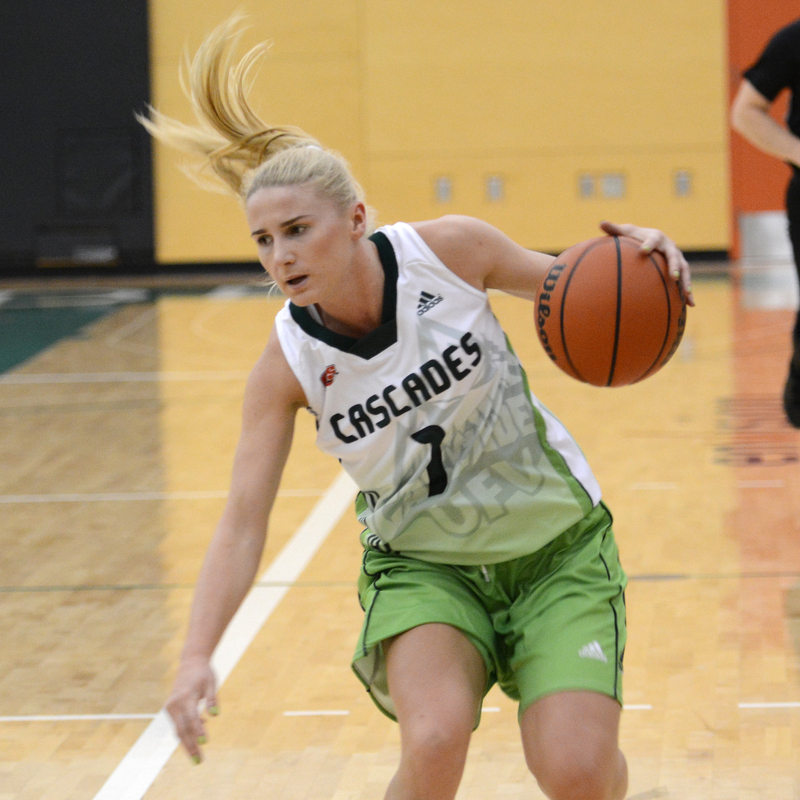 One night after hauling in a Canada West single-game record 31 rebounds, Cascades fifth-year centre Sarah Wierks managed “just” 27 rebounds in the rematch. That’s merely the fourth-best rebounding performance of all time, and her 20 defensive boards are a new conference record. In the process, she eclipsed the 1,000 total rebound plateau – she’s now at 1,003 boards for her career, trailing only ex-Saskatchewan Huskies star Sarah Crooks (1,181) on the Canada West all-time list. Wierks also scored 20 points (5-of-20 from the field, 10-of-11 from the free throw line) and tied her own team record with seven blocked shots. The Cascades got 19 points apiece from Katie Brink and Nataliia Gavryliuk, and Brink had a double-double of her own with 10 rebounds. The Cougars were led by Jayla Verney with 15 points and Yasmene Saghir with 11 points. UFV out-rebounded the Cougars 56-41, and did a much improved job of taking care of the ball against MRU’s press – they had 23 turnovers, 10 fewer than the night before. “It goes along with being a little bit more focused for the game and knowing what you’re getting yourself into, and making some adjustments along the way,” Tuchscherer analyzed. The Cascades gained some breathing room in the race for the third and final Explorer Division playoff spot – they’re now 9-7, three games up on the fourth-place Cougars (6-10) with four games to go for each team. UFV faces the UNBC Timberwolves on the road this coming weekend, while Mount Royal visits the Thompson Rivers WolfPack. Previous articleTrail Smoke Eaters Win In Double O.T.